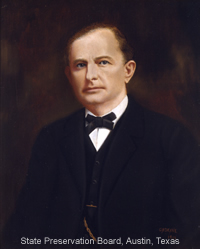 *On August 24, 1917 the House of Representatives filed articles of impeachment against Governor Ferguson. The Senate resolved itself into a court of impeachment to consider the charges. On September 24, 1917, Governor Ferguson filed notice of his immediate resignation with the Secretary of State. On September 25, 1917, the Senate rendered its judgment, removing Ferguson from office and disqualifying him from holding any future state office (114 Tex. 85).